You guys, spring is finally here. It’s like a big giant sigh of relief, right? The tulips and violets are popping up everywhere. The leaves and blossoms are budding on the trees. The days are getting longer and the sun is feeling warmer. My garden is sprouting again. Which might be my favorite part about spring. And I’ve already started to gather sorrel, chives, dill and chamomile greens to make fresh salads. Spring is a time to celebrate all things rebirth and renewal. And all things roasted asparagus. 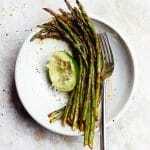 Especially this chili lime asparagus. Depending on where you live, asparagus is in season from early April to late June. Besides it being super delicious, this beloved vegetable actually has a lot of nutritional benefits to take advantage of. It’s packed with good-for-you vitamins and minerals like A, C, E, K, and B6, as well as folate, iron, copper and calcium. And lots of chlorophyll. Which gives it that gorgeous green hue and its anti-inflammatory superpowers. 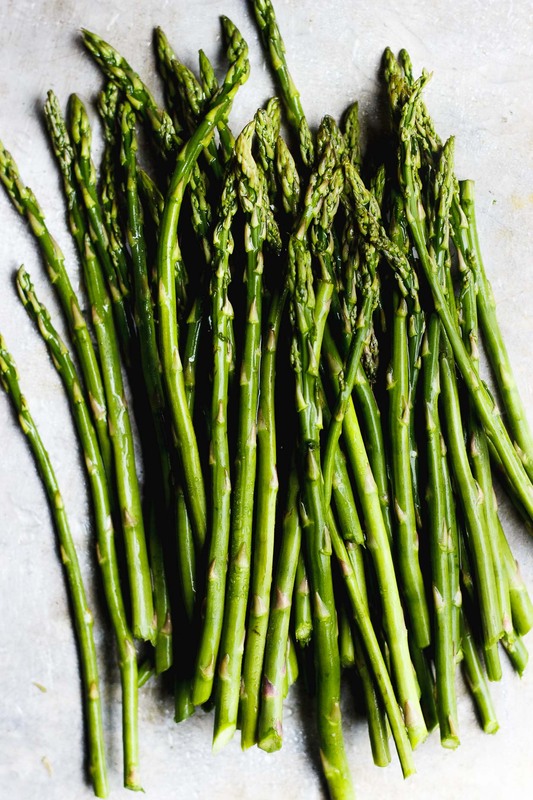 Asparagus is low in calories, fat and carbohydrates, and it is naturally high in fiber. Asparagus helps beat belly bloat. And it may even help your recover faster from a hangover, cool right? Making it an obviously awesome addition to any brunch table. 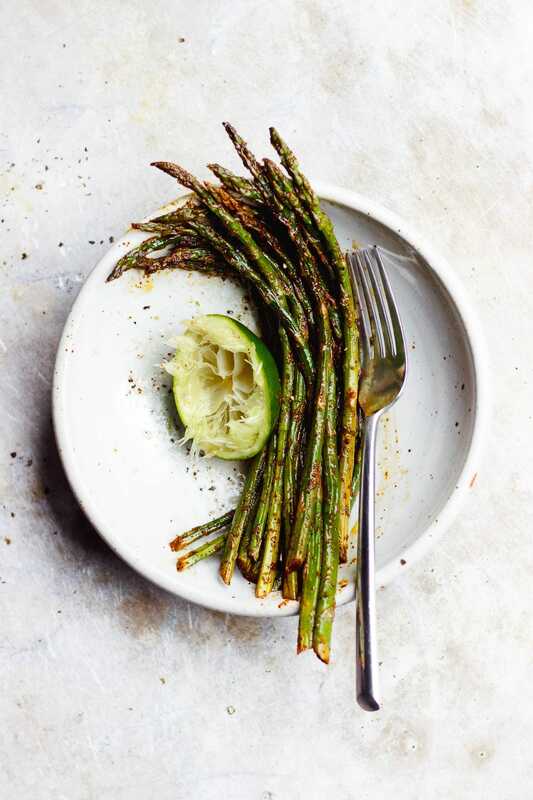 This chili lime roasted asparagus would be really great with a poached egg on top and crusty bread on the side. 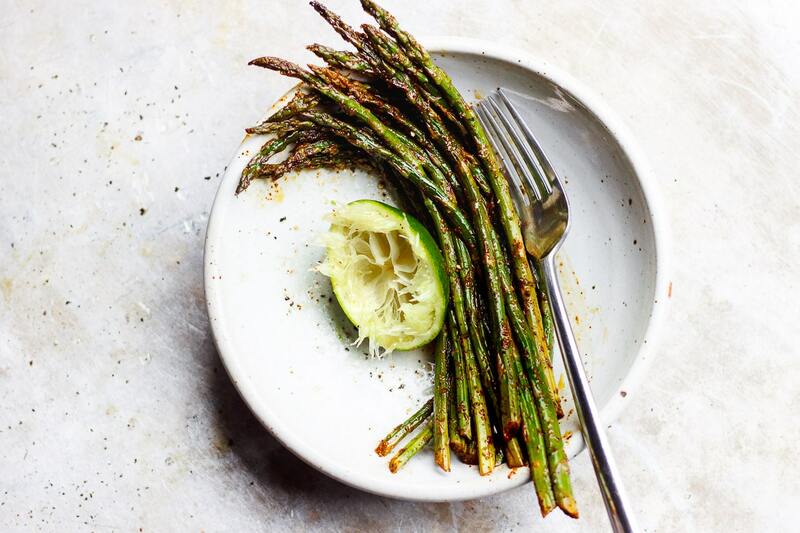 Chili lime roasted asparagus is so flavorful. And it is so simple, and so fresh. It comes together with minimal ingredients and in under twenty minutes. Chances are you can make this with the pantry staples you have on hand. Because if you have chili powder, olive oil, salt, pepper and a lime, you’re good to go. Rinse the asparagus, pat dry and trim the ends. In a small bowl whisk together the olive oil, chili powder, garlic powder, salt, lime juice and lime zest. 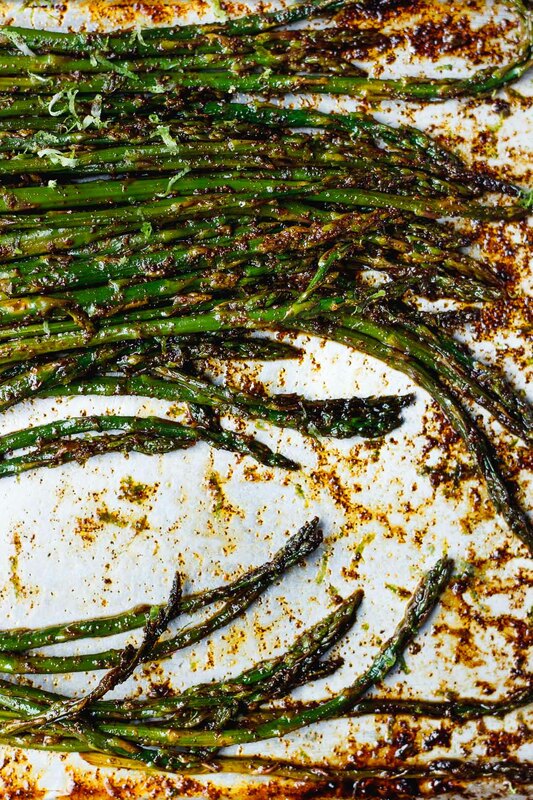 Spread the asparagus on a baking sheet and pour the chili lime mixture over top. Toss the asparagus lightly and organize the spears to lay them flat. Roast for 10 minutes or until bright green and browned slightly. 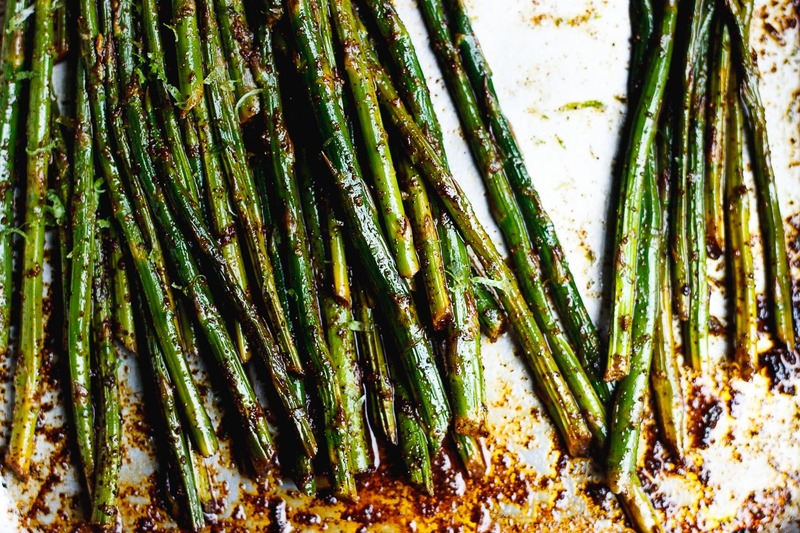 More asparagus recipes you will love. I am obsessed with asparagus season! This recipe looks right up my alley. And I’ve never heard about the hangover cure – hmm just another excuse to load up while it’s spring. I’ve got all the ingredients for this in the fridge, so looking forward to trying this over the next few days! I love asparagus and am so excited to try this. Thank you and Happy Spring! I swear you are a master at taking a single simple vegetable and making it so exciting and new – this asparagus included. I just realized I don’t eat enough asparagus! This will make a lovely side dish for so many summer meals. I am so in love with your recipes, Sherrie! I literally want to make every single one of them! You are a constant source of inspiration and a total veggie queen!